A report prepared in 2016 for the billionaires attending the annual World Economic Forum in Davos, Switzerland, estimates that there are more than 150 million tonnes of plastics in the oceans already, with another 8 million tonnes being added each year. 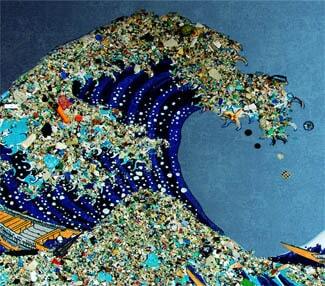 That’s 5 trillion pieces of plastic in the ocean and counting. If we carry on at this rate, by 2050 plastics in the ocean will outweigh all the fish. But there is a contradiction. Plastic is causing great harm to the environment, and yet it is a fantastic material that has allowed for advances in medicine, hygiene, food preservation, water transportation and much more. Our starting point should be that plastic does not exist in isolation, separate from the world in which it is produced. In many ways the story of plastics gets to the heart of what’s wrong with capitalism. It is a by-product of the fossil fuel industry — 99 percent of all plastics are produced from chemicals sourced from oil and gas. Its production was driven by the relentless drive for profit at the heart of the system. War further fuelled its development, while state investment helped increase production, and from the outset vested interests have encouraged us to use more plastic. Even today, when millions of people would like to cut down our plastic use, production of new virgin plastic is actually increasing. Far from being driven by “consumer demand” — and therefore the fault of individual consumers — plastic production is locked into the fossil fuel-based economy of modern industrial capitalism. That is where we must look for the root of the climate crisis. Plastic production began in the mid-19th century, when celluloid, derived from the natural cellulose polymer in plants, was developed as a substitute for ivory. The first truly synthetic plastic was Bakelite, introduced in 1907 as a substitute for shellac. It paved the way for mass production, as scientists were no longer trying to emulate nature but instead seeking to “rearrange nature in new and imaginative ways”. The 1920s and 1930s saw an outpouring of new materials from labs around the world. Meanwhile, the many uses of oil were being discovered. As Ian Angus shows in Facing the Anthropocene (Monthly Review Press, 2016), while oil companies were busy building markets for petroleum as fuel, paving the way for the mass production of cars, the chemical industry was developing entirely new materials made from the by-products of oil refining. True or not, that story sums up the origins of the modern petrochemical industry – the principle that every hydrocarbon taken from the ground can be used to make a profit. The “something” that could be produced from burning ethylene was polyethylene, discovered in 1933. It was so unlike any other known polymer that no one could envisage a use for it. But inexpensive, durable and pliable polyethylene became the most commonly used polymer. In the early 20th century, petroleum and chemical companies began to develop alliances and form vertically integrated companies. Today the largest players — DowDuPont, ExxonMobil, Shell, Chevron, BP and Sinopec — are integrated companies that produce both fossil fuels and plastics. Plastic production took off in the 1930s,but it was the Second World War that transformed production and paved the way for the widespread use of plastics in everyday life in the post-war period. War allowed plastic to showcase its versatility. The major plastics we know today — polyethylene, nylon, acrylic, polystyrene — were put to use during the war. The US government spent over $3 billion on building or expanding petrochemical plants during the war, quadrupling plastic production by 1945. When hostilities ended US oil and chemical companies were able to buy these factories at bargain basement prices. As early as 1943 DuPont had devoted a whole division to prepare prototypes of housewares that could be made of the plastics which at that point were being commandeered for the war, and such products became the basis of the postwar plastic explosion. The buoyant and insulating polystyrene, used by the US Coast Guard for life rafts, was now used for picnic cups and coolers. Polyethylene’s extraordinary capacity to insulate at high frequencies was side lined for a new career bagging sandwiches and dry cleaning. As one early plastics executive recalled, by the war’s end it was obvious that “virtually nothing was made from plastic and anything could be.” It was also clear that by expanding products made of plastic vast profits could be made. And so plastics entered our homes, our cars, our clothes, our playthings, our workplaces, even our bodies. Is throwaway culture to blame? In discussions about plastic use it is common to blame mass consumerism and a throwaway culture for the environmental problem of plastic. However, rather than being demand led, the throwaway culture was created and driven by the corporations who profit from it. The amazing materials created from the waste products of the oil and gas industry had to first be turned into new products and then a demand created for that new use. But the industry faced a big problem. Plastic is characterized by its strength and durability. A plastic product can last a long time, negating the need to buy another. So the industry had to come up with new ways to make us want and need more plastic. Disposable products were initially a hard sell to a generation that had come through the Depression and war-time, when a “make do and mend” mantra meant nothing was wasted. People initially kept the new plastic goods rather than throwing them away after one use. Similarly, plastic bags, the epitome of single use plastic, were unpopular when they were first introduced in the mid-1970s — shoppers did not like the fact that the cashier had to lick their fingers to get them free. But in the end the big stores were won over by economics. Paper bags cost three to four times as much, and once one or two big chains introduced them, all switched to plastic. Products were redesigned to be used only once, from lighters to pens, razors to straws. Today half of all plastics produced go into single use applications, and at the heart of this is packaging, which accounts for 26 percent of all production. Perhaps nothing sums up the irrationality of capitalism more than this — materials that can last practically forever are used to make products designed to be thrown away. And so this brings us to where we are today — swimming in plastic. According to a recent study published in Science Advances, 8.3 billion tonnes of the stuff has been produced since the early 20th century. And production keeps on rising, with approximately 400 million tonnes of plastic being produced globally each year. Worldwide, people use somewhere between 500 billion and 1 trillion plastic bags a year — more than a million a minute. So it is not surprising that plastic bags have become a primary target in our desire to cut down on single use plastic. However, New Scientist recently calculated a cotton tote bag must be used 131 times before its environmental cost falls below that of a disposable plastic bag, mostly because of the impact of growing cotton. Similarly, purely in energy terms, because a steel water bottle takes so much energy to make, it needs to be used 500 times compared to a disposable bottle. Another way to limit the amount of plastic ending up in our oceans is to recycle more of it. Just 14 percent of all plastic across the world is collected for recycling, and of that only one-third — 5 percent of all production — is actually recycled. The rest is either burned, sent to landfill or enters the environment as pollution. According to experts, in theory all plastic could be recycled, but there are many barriers in practice. The lack of uniform recycling facilities is a problem. The many different types of plastic need to be sorted and recycled separately. While many facilities still sort by hand and cannot process most plastic, a state of the art waste and recycling center in Southwark, south London, shines light onto discarded plastic travelling down a conveyor belt; the reflection indicates the type of plastic and air jets push each type into a different stream. The plant can even recycle plastic bags and black plastic food trays — which are the hardest to recycle. However, even the most sophisticated processing centers still face the problem of mixed plastics in one product, favored by manufacturers. And in a capitalist economy, no recycling process is viable unless there is a market for the recycled product. Many manufacturers demand clear plastic packaging which is very difficult to produce from recycled. Much of Britain’s plastic waste is sent abroad for recycling. However, recent exposés have shown that much of our exported plastic waste is just burnt or dumped in landfill sites from Turkey to Malaysia. China’s recent announcement that it will no longer take “foreign rubbish” means traders are looking for other countries to take their recycling waste. All this doesn’t stop manufacturers cynically trying to exploit people’s concerns over plastic waste. Many realized early on that claiming their product was recyclable would help sales, even if the facilities to recycle it did not exist. In most cases, big business finds it cheaper to produce new plastic than to recycle. And this is the crux of the issue — even if we can increase recycling rates, which of course we should fight for — it won’t be effective unless recycled plastics replace newly manufactured plastic in production. In reality, the giant multinationals of the fossil fuel and petro-chemical industries are right now increasing plastic production and planning for more. Fracking and the so-called shale revolution in the US have helped fuel the plastic industry in recent years. US fracked natural gas is rich in ethane, needed to create ethylene, a primary feedstock for plastic. Fracking has led to a glut of cheap ethane that is even profitable for export. As capitalism fails to break from its reliance on oil and gas, and instead expands upon the fossil fuel infrastructure already created, it continues to be logical — and highly profitable — to use the waste products to make more and more plastic. So what do we do? Firstly, rather than take a moralistic approach to consumers, we need to push the blame upwards, to direct our anger at the producers of plastic and the oil and gas companies and at the governments that let them frack. They must be made responsible for what happens to waste plastic. Public outcry has already won some changes. The European Union is preparing a ban on single use plastics including cutlery, straws and plates. The UK government is set to introduce a Plastics Pact, under which the companies responsible for 80 percent of plastic used in the UK pledge to make all plastic packaging to be recyclable, reusable and compostable, and to eliminate all single use plastic packaging by 2025. This is a start, although limited by being voluntary rather than binding. We should demand and fight for better recycling facilities, in our communities and workplaces. But none of this goes far enough. To prevent catastrophic climate change we need to leave fossil fuels in the ground. To stop our oceans and natural world being clogged up with plastic we need to reduce plastic production. The logic of capitalism — the pursuit of profit — dictates the opposite. It is quite possible to imagine a world with less or even no plastic — after all it has only come into widespread use since the 1950s! — but it would be anathema for capitalists to abandon their sunken investments in the fossil fuel infrastructure or to give up producing something so profitable. So we will have to force them to act. Anti-fracking campaigns have been immensely important in Britain in stopping, or at least slowing down the spread of the fossil fuel landscape. But we also have to look at where power lies in society to take on these mammoth corporations. When Ineos truck drivers walked out on strike in 2013, it threatened to cut off oil to half of Scotland, hitting Ineos’s profits hard. When French energy workers went on strike against a new work law they blockaded fuel depots leading to a petrol shortage, while electricity production dropped and had to be imported. These examples give a glimpse of the potential power of workers. They show a collective power that not only stops production and hits profits but could also transform society totally. Plastic is an amazing material that has been distorted by capitalism. If we broke from fossil fuels we could develop plant-based plastics to replace synthetic ones and rational decisions could be made about how to use such strong and durable substances. But this will require fundamental change. We must fight now to prevent further expansion of the fossil fuel landscape and to stop more plastic entering our environment. But we must link it to wider demands and a movement that can challenge all the priorities of capitalism. Amy Leather is Joint National Secretary of the U.K. Socialist Workers Party.